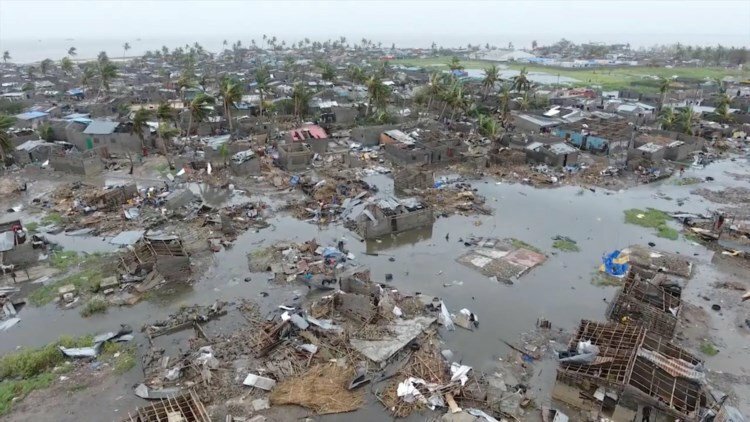 Trop­i­cal Cyclone Idai slammed into the coast of Mozam­bique near Beira on Fri­day. 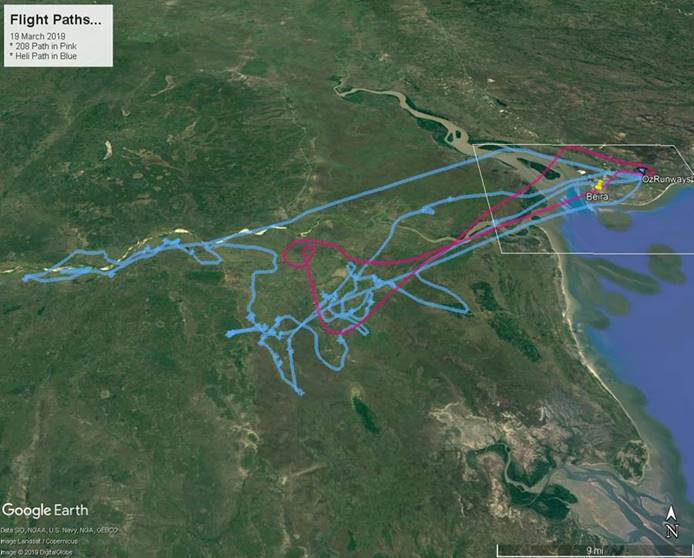 Sim­i­lar in strength to a Cat­e­gory 3 hur­ri­cane, the storm left wide­spread destruc­tion and com­mu­ni­ties under deep water in an area over 30 miles wide! 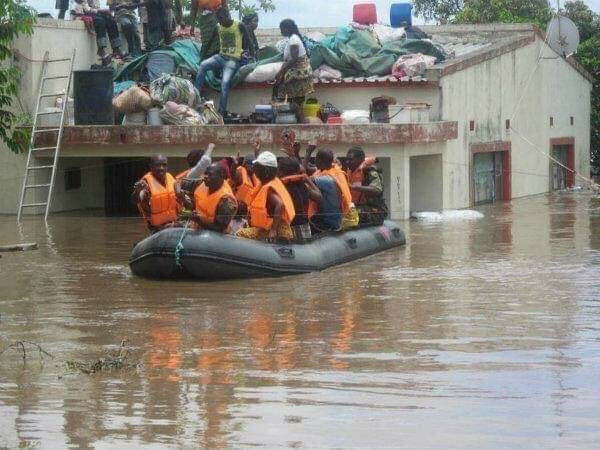 Hun­dreds of peo­ple are already con­firmed dead and sur­vivors are still stranded on rooftops and in trees as the flood­ing has not yet receded. Our lit­tle Fatima is in this area and we have no way of find­ing out how she is because no phone ser­vices exists. All cell tow­ers were dam­aged as well as roads and bridges have been washed away for many miles. Before and after flood­ing: Peo­ple are stranded on rooftops. Peo­ple gath­er­ing in the high­est areas. Our Chris­t­ian friends, Mercy Air, who depend on dona­tions, are in the area help­ing sur­vivors with their heli­copter and plan to send their 2nd chop­per on Mon­day. Funds are needed imme­di­ately to assist with FUEL for their emer­gency food drops and rooftop res­cues. No gift is too small. All love gifts des­ig­nated CYCLONE RELIEF will be sent directly to them to help them with FUEL. 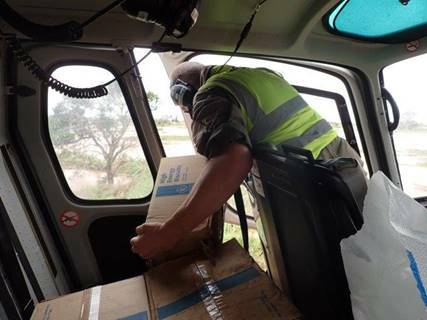 Mercy Air mak­ing air drops of food for stranded citizens. Mercy Air flight paths mak­ing relief runs on Tuesday. Food packs have been donated by other groups, but there is no way to get it to those in need except through air drops. 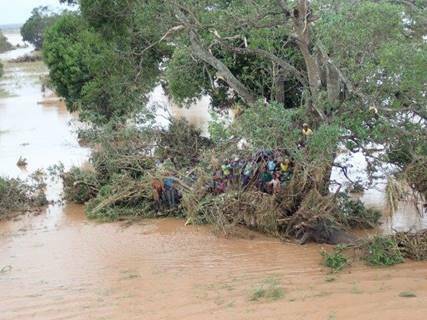 These guys are work­ing long hours to get help to those stranded in trees, on roof tops, and small islands of land. The water will not recede for weeks, and no roads exist to the need­i­est areas. Peo­ple are still stranded through­out the area. 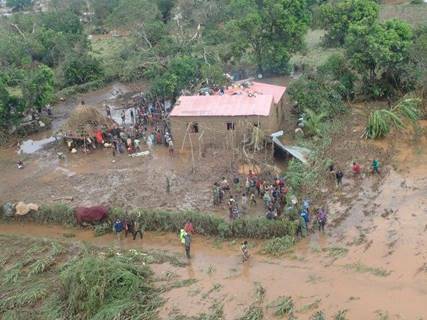 Let’s give them a help­ing hand and pray our Fatima and her school­mates are safe. Make checks payable to Orphans Unlim­ited but please note CYCLONE RELIEF on the memo line of the check. Chil­dren are the cen­ter of Jesus’ eye, and He wants ALL chil­dren every­where to know how much he loves Him. I know these num­bers must seem too good to be true, but believe me, these are TRUE HEAD COUNTS. The largest pop­u­la­tion in Balama is UNDER 15 years age. So it makes sense that the largest group in the churches will be the chil­dren. This month’s stag­ger­ing report even caught me off guard! BAWANA GAMES: 30,825 CHILDREN/WEEK HEARD GOD’S WORD COUNTY WIDE!!! Note: Most of the chil­dren in the Bawana Games groups have already prayed to receive Christ into their hearts. Tug-of-war in the vil­lage takes on new meaning! All our kids lined up on the soc­cer field for Bawana games. In Balama, chil­dren are in their class­room only half days. You either enter at 7 a.m. and exit 11:30a.m. or attend the after­noon ses­sion from 12:15pm to 5pm. Chil­dren in grades 5 and up are assigned a Phys­i­cal Edu­ca­tion day which occurs dur­ing the time frame they are not in the class­room. Exam­ple: If a child is in the morn­ing class, then they will have P.E. one after­noon dur­ing each week LEAVING FOUR DAYS for sports and Bawana Games at our mis­sion station. Kids need to be active to stim­u­late brain growth, thus enhanc­ing their learn­ing capac­ity. So we pro­vide plenty of activ­i­ties each morn­ing and after­noon at our bas­ket­ball court or soc­cer field. All the younger chil­dren have a 1 hour homework/study time with Pas­tor Jose each day. Jose has com­pleted 12th grade, so he tutors the younger chil­dren in Por­tuguese and the more dif­fi­cult school assignments. Our High School teenagers have study time at our dorm with Pas­tor Armando each day. We have a COMPLETE LIBRARY of school books for them to read and take notes from. This study pro­gram worked very well last year, and ALL our high school stu­dents improved their grades. With the chil­dren all set­tled into school, our lives can con­cen­trate on many chores that keep this mis­sion ticking. 1. 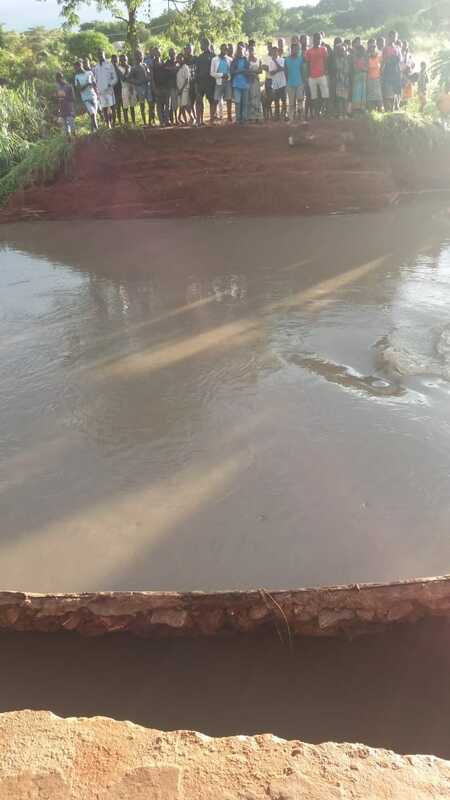 Rains are still com­ing nightly, which has caused us to halt all con­struc­tion at that site due to super muddy con­di­tions. We will raise the roof, lit­er­ally, as soon as the rain stops falling. It’s a patience game, as the rains should be dimin­ish­ing, but this year weather pat­terns have been dif­fer­ent than in the past. 2. Brick mak­ing (cin­der blocks) is mov­ing for­ward at max­i­mum capac­ity. Our team makes 256 large (28 lb/14kg) bricks daily for house #6 and all its sup­port buildings. Brick mak­ing for house #6. 3. Our 6 ton truck, so vital to food buy­ing, now has a new set of front springs. This truck sat idle for FOUR due to the lack of parts. But thanks to Eric Dry in RSA and friends in the trans­port busi­ness, the parts finally arrived last week. Patience is some­thing every­one learns here whether you want too or not. 4. Car­pen­ters are hard at work mak­ing doors, win­dows, and kitchen cab­i­nets. Our goal is to have every­thing ready to be mounted in House #6 as soon as the roof is on. BECAUSE YOU CARE, OVER 2,000 ORPHANS AND THE WIDOWS WHO CARE FOR THEM, ARE EATING HEALTHY AND THE CHILDREN ARE ABLE TO GO TO SCHOOL. THANK YOU FOR YOUR JESUS HEART TOWARDS OUR CHILDREN. Blog is very brief today as BBB’s inter­net is out with just brief moments of con­nec­tion. She did man­age to get us this photo of baby Jesuino. He was released from the hos­pi­tal today with a low, but improved, Hbg of 8. He is in a frag­ile con­di­tion, but improv­ing. Please con­tinue to pray. They are all so happy he is back at home. Baby Jesuino in his new baby mosquito-netting… or “anti-mozzy net”, as BBB calls it! Please pray also for the restora­tion of com­mu­ni­ca­tion channels. Just wanted to send a quick mid-week update and prayer request. 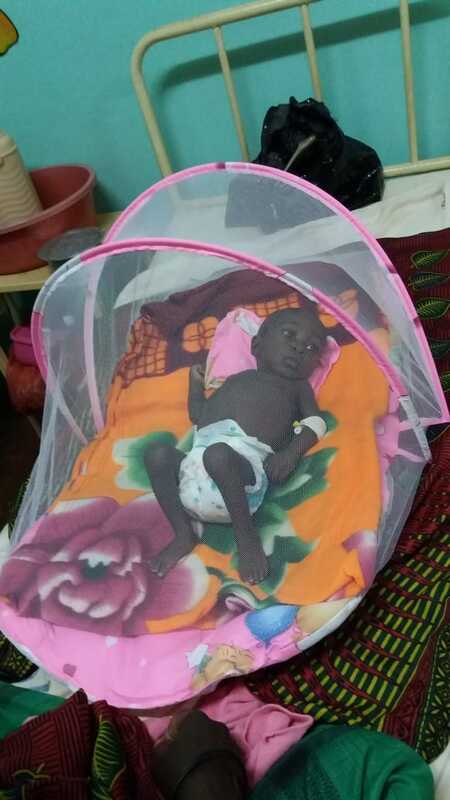 Baby Jesuino con­tin­ues to improve in the hos­pi­tal after his Malaria and ane­mia scare last week. How­ever, he is in need of a 2nd blood trans­fu­sion today to cor­rect his severe ane­mia. He still has a bat­tle before him, so please con­tinue to lift him up in prayer. Baby Jesuino with two of our fos­ter moth­ers watch­ing over him. JESUINO started with a fever late Tues­day night, which devel­oped into full blown malaria by Wednes­day morn­ing. Even with oral malaria treat­ment, his ema­ci­ated body quickly lost strength by Thurs­day morn­ing. The malaria kills the red blood cells caus­ing severe ANEMIA, the most com­mon killer of post malaria babies and young children. Jesuino before his life threat­en­ing illness. Early Thurs­day, I raced him to the emer­gency room, with his con­di­tion dete­ri­o­rat­ing before my eyes. His lab results showed his Hemo­glo­bin had dropped to a crit­i­cal level of 4!!! Nor­mal is 12 to 14. With FERVENT PRAYER, he sta­bi­lized in the emer­gency room, but lost con­scious­ness after a short cry when they began his IV. (I was just thank­ing the Lord they found a vein!) With IV malaria treat­ment plus IV flu­ids, he slept com­fort­ably as we worked to find a donor with an A+ blood sup­ply. By 3 pm, a blood trans­fu­sion was admin­is­tered, which rapidly improved his vital signs. Fri­day, he looked alert and back to his old self. Eat­ing and grab­bing at what­ever came close to his lit­tle hands. By Sat­ur­day, the Doc­tors told us he has devel­oped bronchial pneu­mo­nia, but is respond­ing to treat­ment and eating. THIS LITTLE GUY IS A TRUE FIGHTER WITH THE KING OF KINGS WATCHING OVER HIM. Few would have sur­vived all that has come against him. Next week’s blog will pro­vide a fur­ther update. Keep him in your prayers, for he’s not out of the woods yet, and may need a 2nd blood transfusion. The Balama Doc­tor made his monthly visit, for it was time to update their med­ical cards, and let the 10 new chil­dren receive their first phys­i­cal. The babies were not crazy about get­ting vac­cines, but then I’ve never seen any­one who liked shots. Before leav­ing, the Doc­tor declared our chil­dren in good health. PTL! Each baby was weighed and mea­sured for his growth chart. Dr. Inter­views each child for health issues. SCHOOL DAYS, SCHOOL DAYS, OUR MOMS ARE CELEBRATING SCHOOL DAYS! Mon­day found our staff busy dis­trib­ut­ing back­packs filled with the appro­pri­ate books, pens, pen­cils, rulers, etc. for each grade level from 1 to 12. The kids are thrilled for it means new school uni­forms and shoes! 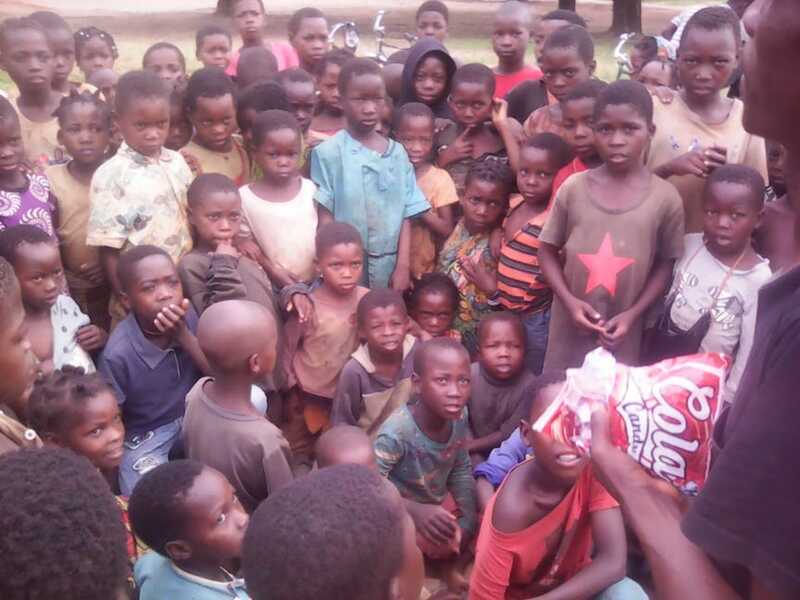 Vil­lage orphans receiv­ing school materials. ALL OF THIS IS POSSIBLE BECAUSE YOU GAVE SO GENEROUSLY. OUR CHILDREN HAVE ALL THE TOOLS NEEDED TO DO THEIR SCHOOL WORK PROPERLY, INCLUDING COMPLETE SETS OF BOOKS FOR THE HIGH SCHOOL KIDS! Note: The 1st to 7th grades receive their school books from the school district. First day of school! Our teens headed to high school. Most of the chil­dren really do like going to school, but like all fam­i­lies, we have a few lit­tle boys who would pre­fer a full day of recess. With 8 of our 10 newest fam­ily mem­bers get­ting to enter the huge Balama Town school sys­tem for the first time, it has been a very busy week for Capena and Pas­tor Armando. These 2 men worked hard seek­ing school doc­u­ments so they could trans­fer these 8 new stu­dents from their vil­lage schools to the Balama school. By Fri­day, the final doc­u­ments were signed and all our 80+ school chil­dren were in their proper classes. PTL! Pri­mary school stu­dents get­ting uniforms. Our infant milk for­mula pro­gram is expand­ing with 22 babies cur­rently in the pro­gram. Three of those infants entered in the last 2 days. Late yes­ter­day, Elsa, a 6 week old infant girl was sent to us from the hos­pi­tal, accom­pa­nied by her men­tally chal­lenged mother, hus­band, and uncle. When the wife’s breast milk dried up a week ago, her hus­band scraped up money from all this fam­ily mem­bers to buy 1 can of milk and a bot­tle ($6.50 or R85). But as the for­mula ran out, the mother took the baby into the bush. It took the fam­ily 3 days to find her. She was fed on Kool Aid until they got her to us, for that was all they could afford. The Uncle is well versed in bot­tle feed­ing, so he will teach Elsa’s Grand­mother how to prop­erly bot­tle feed her. Baby Elsa in arms of her uncle. THANKS TO YOUR LOVE GIFTS, THESE 22 BABIES ARE RECEIVING THE ONLY NOURISHMENT THEIR BODIES CAN ABSORB. 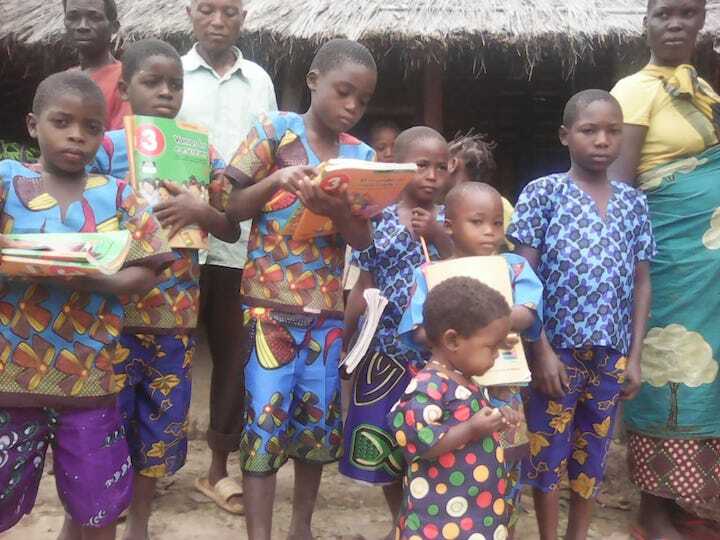 BLESSINGS AND MUCH THANKS FOR ALL YOU DO TO HELP THE CHILDREN OF MOZAMBIQUE. Our whirl­wind week start­ing at 8 a.m. Mon­day morn­ing with a call from Balama’s Social Ser­vices Direc­tor. He had a crit­i­cally mal­nour­ished 1 year old orphan boy, (4.3kg) (9.5 lbs), who needed imme­di­ate place­ment with us. An hour later he was in our care. JESUINO UPON ADMISSION, JANUARY 26, 2018. Sorely neglected by his Aunt, lit­tle Jesuino’s (Jez-wee-noo) body could not take much more star­va­tion. In just 5 days of lov­ing care, Jesuino is fill­ing out his sunken cheeks, and allow­ing oth­ers to touch his hand with­out pulling away. He clings to his fos­ter mother, Helena, for fear she will aban­don him. His “aban­don­ment syn­drome” will sub­side as he real­izes food will always be there, and that we will not leave him alone. Helena feeds him a very high protein/vitamin cereal on demand, along with milk for­mula, so that we can get max­i­mum calo­ries into his tiny tummy each day. He also eats “Plumpy Nuts”, a high protein/peanut packet made specif­i­cally for mal­nour­ished chil­dren. His 1 week pho­tos show how well he is gain­ing weight. JESUINO 5 DAYS LATER, SITTING IN LAP OF HIS FOSTER MOTHER, HELENA. WEDNESDAY WAS A CIRCUS WITH 9 KIDS IN THE RING! Two fam­i­lies of needy orphans from 2 dif­fer­ent vil­lages moved in, fill­ing our newest home, VICTORY HOUSE. 13 orphans now call Vic­tory House their home. This means we need to do dou­ble time to com­plete house #6, for we only have 2 girl, and 2 boy beds avail­able out of 5 fos­ter homes. Rainy weather, cyclones, and a short­age of bricks has put us behind sched­ule. We are on it! Mov­ing as fast as weather allows. 4 orphans from Kionga, ages 5 to 15, were liv­ing with their grand­mother, who has her hands full with 5 chil­dren of her own, plus a debil­i­tated hus­band. We placed them in our food pro­gram a month ago, which helped curb their star­va­tion until per­mis­sion was granted by Social Ser­vices to accept them into our family. KIONGA FAMILY: Clau­sia, 15 years, 8th grade; Alberto, 10, 1st grade; Dinis, 7, and Egidio, 5, pre-school (2 youngest must learn Por­tuguese to enter 1st grade.) All liv­ing in Vic­tory House. 5 orphans from Nacala Vil­lage, who were a CHILD-HEADED HOUSEHOLD (no adult look­ing after them), were doing very poorly after their 19 year old Sis­ter was no longer in good health and not able to care for them. She moved in with her Aunt, leav­ing these kids to fend for them­selves. That left boys 16, 12, 10, 8, and a girl, 5 with huge respon­si­bil­i­ties! Social Ser­vices was noti­fied, and agreed they should come live with us. NACALA FAMILY: (L TO R) LUCIA, 5, preschool; CASTRO 7, USSENE 8, AND MARIO 12. ALL IN 3RD GRADE. All but Mario liv­ing in Vic­tory House. CIPRIANO, 16, 8TH GRADE, AND BROTHER MARIO, 12, 3RD GRADE liv­ing in boy’s dorm for over 12 to 18 year old boys. The 16 year old boy, Cipri­ano, (Sip-ree-an-o) has a bril­liant mind, mak­ing straight A’s in 7thgrade. He truly desires to con­tinue his stud­ies, and now lives in our high school dorm along with his 12 year old brother, Mario. His 4 broth­ers are also top notch students. These chil­dren DEFIED THE ODDS, man­ag­ing to go to school in their vil­lage with NO ADULT look­ing over them. Not many kids would do that! It is time to “let them be kids”, by tak­ing over the adult respon­si­bil­i­ties they have tried so hard to manage. OUR 5 FOSTER HOMES ARE NOW HOME TO 49 ORPHANED OR ABANDONED CHILDREN. SPONSORS ARE URGENTLY NEEDED FOR EACH OF THESE 10 CHILDREN, AS OUR GENERAL BUDGET WILL NOT SUPPORT THEM FOR LONG . $30/MONTH/CHILD is what we need. Check out their pho­tos, for they are a hand­some group, although slightly mal­nour­ished. Please con­tact me via email if you’d like to spon­sor any of the chil­dren in these pho­tos. I will per­son­ally send you a close up photo of your child and their per­sonal data. Thank you so very much for lov­ing all these chil­dren that Jesus sent us.